There is a command line application called gcalcli that allows you to access your Google Calendar from the Terminal or from GeekTool. It is a bit complicated to install though. Type cd followed by a space, then drag the gdata-#.#.# folder onto the window. Type ./setup.py install and press return. Save as .gcalclirc in you user home folder. There are lots of different options for gcalcli. Detailed usage instructions are here. I'm pretty new to all of this, so naturally I'm having some trouble. My most recent attempt ended with a bunch of error messages indicating a failure to authenticate my google account. Also, I'm pretty unclear what to do...after step 18. Through the process of this guide I've made three different text edit files and I'm not sure how they all play into my final product. What should the script read for the terminal that is displayed on the desktop? Thanks again! It's a long while since I wrote this, and I don't actually use this Geeklet on a regular basis, so I'm not sure I'll be much help. This is also definitely one of the more tricky ones to set up! Open up Terminal and paste in "/usr/local/bin/gcalcli --width=15 calw 2" without the quotes. If the error you get is "Error: Failed to authenticate with Google Calendar!" then it suggests that gcalcli installed fine, but there is a problem to do with file with your username and password. 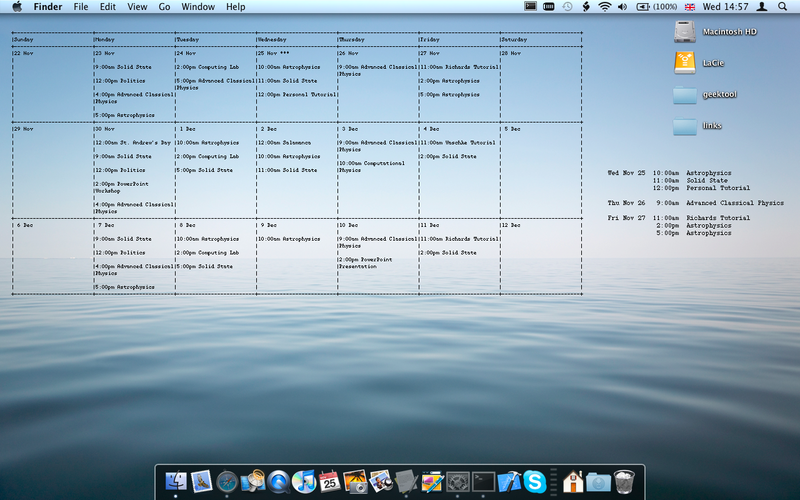 then restart the Finder by holding Control and Option, clicking on the Finder icon in the Dock and choosing "Relaunch." You will want to repeat this process with NO at the end of the command to hide the hidden files again once you are done. I received an error on line 6, running it via sudo worked fine 'sudo ./setup.py install' Return then enter your pw when prompted. Also regarding the plain text file with google username and password - I suggest using two step authentication, go into your google account and then create a new password to authorise this app and use that in the .gcalclirc file. Bit more secure. I hope you are still around matt... I stall at step 14. There is no /usr/local/bin on Mac OS X Lion. I tried /usr/bin/ but then the script just gives a blank screen. Any tips? 5. Continue as described above. This is just amazing Matt, thank you for sharing. Can you help me with this? The geeklets work fine, but the columns are not aligned (some rows take more space than others). Not sure about the error, but in your Geeklets, make sure you are using a fixed width font like Courier or Menlo to ensure the the columns line up. Ooook! I didn't know that some fonts could have a fixed width. Now it just looks amazing! Thank you! Hello! I am very new to GeekTools and this is a very complicated one to install. I was able to get it mostly working though. The main problem I have is one line of it is misaligned. It was fine at first but I deleted some events on line and when it updated it was misaligned. Here is a link to a screen shot I took of it to show what I mean. http://i.imgur.com/DZpUS.png Any ideas?